Taking up a sizable footprint at the RI Home Show, the RI Spring Flower & Garden Show is full of wonderful gardens, gorgeous flowers, how-to seminars, and learning centers focused on solving your outdoor problems and inspiring you to indulge in the world of gardening. From Floral Competitions to amazing-yet-practical gardens, this value-oriented, educational experience will leave you with a touch of spring and some inspiration to enjoy! Bringing together designers from all over New England and nationally accredited judges, Dream, Discover, Design! will be our largest and most creative Flower Show EVER. Over 48 contemporary and traditional designs will be on display at the RI Home and Garden Show for your delight and inspiration. Artistic creations of all sizes, shapes, and colors will make you see horticulture in ways you never imagined. 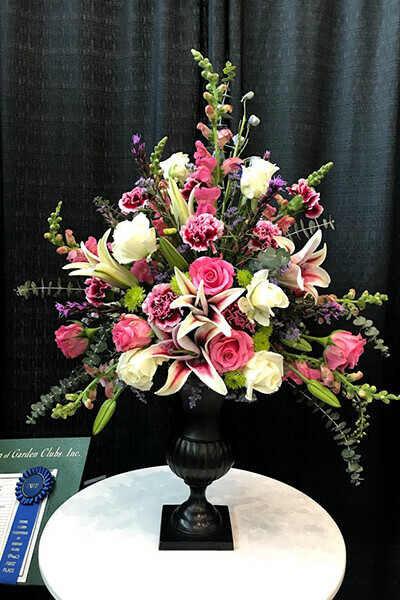 This is a judged floral design competition which includes educational exhibits and botanical arts. Come and cast a vote for which design is your favorite!RIFGC is thrilled to be coordinating with RIBA in a fresh and exciting partnership of new opportunities. Working with the hundreds of students that participate in the Home Show perfectly parallels our outreach and education efforts over the past 89 years. Sharing our passion and love for design, the environment, and horticulture has always been our mission. At the RI Home and Garden Show we are able to do that in a relevant, inspiring, and meaningful way.